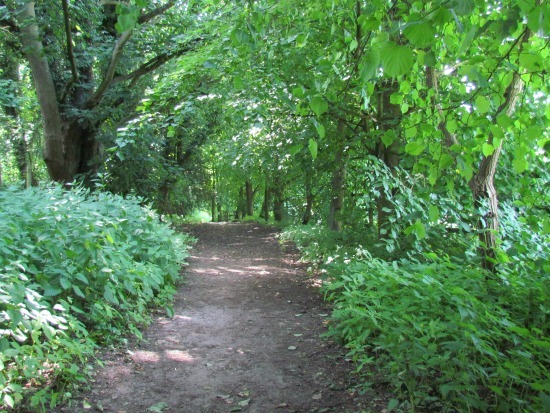 This is a gentle stroll along footpaths between Little Berkhamsted and Epping Green. The route is through undulating countryside and twisting woodland paths. One part of the walk, towards the end, can be a bit muddy after rain, so take boots. The walk has the advantage of starting near a pub, has a pub half way round. The last part has open views across to Brookmans Park, Wildhill and Essendon. Park near Little Berkhamsted Cricket Ground and cross the road, heading towards the church. Just before the church you will find a gate. Enter the field and walk straight ahead with the churchyard on your left. This is Little Berkhamsted footpath 9. Continue walking straight with the hedge on your left until you come to the end of the field. A path leads ahead to a gate into the lane, but your way is right along the hedge as the path (Little Berkhamsted footpath 10) branches and heads south. Follow this path keeping the hedge on your left and continue across the next field until it dips in the north east corner. Here you will find a small stream. There may still be a plank across it on your left. Once on the other side, climb the bank heading for a step stile straight ahead. This step stile leads you down a sheltered path with trees either side and after a few minutes you reach another step stile leading to a clearing. Head straight for a few metres, until you notice a path (Little Berkhamsted footpath 11) on your left. At this point you head left downhill and across the clearing, heading for a telegraph pole in the north east corner of the clearing. Cross another step stile and head down into the wood, where you meet a bridleway (Little Berkhamsted bridleway 23). Turn right and follow this path as it twists and turns up and down hill through woodland before it veers sharp left down a small hill and immediately up again. You come to a small bridge after which the path veers right and climbs a hill before opening out into a bridle path. Keep following this path for about 100m. Just as it veers left look out for a step stile on your right leading to an open field. This is Little Berkhamsted footpath 14. Cross the field keeping the hedge on your right until you reach another step stile on the far side. Cross this and head across another field keeping the farm on your left and the hedge on your right. Go through a gate, cross the farm track and immediately go through another gate and down a farm road leading to the lane. When you reach the lane, you have the option of turning right to reach the Beehive pub. On leaving the pub turn left on the lane and almost immediately on your right just before the bend, you will notice a bridlewy signposted to Little Berkhamsted (Little Berkhamsted bridleway 22). Take this path and follow it as it first goes straight and then turns right near some houses. Keeping the water tower and the mobile phone transmitter on your left, continue along this track. After 200m it veers right, but you continue straight on along Little Berkhamsted bridleway 22. This part can be quite muddy and is used by horse riders. However, walkers have created an alternative path alongside and through the trees, so you can avoid the worst of the mud, but you won't avoid it all. 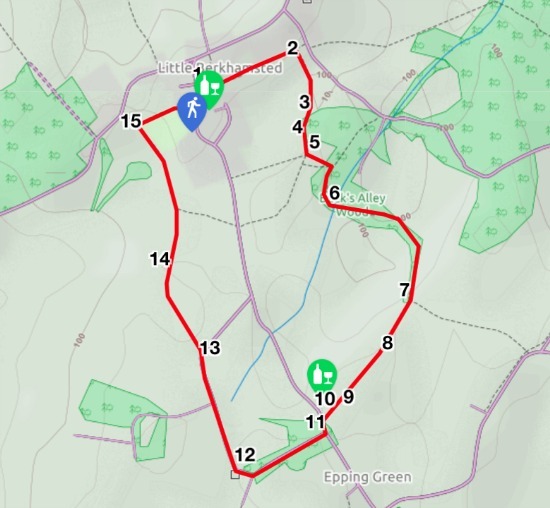 At the end of this wooded and muddy part of the walk, you will have views on your left across the valley to Wildhill, Essendon and Brookmans Park. Continue walking along the edge of the field keeping the hedge on your right until you see Little Berkhamsted Cricket Club through the trees. Go through the gate on your right and take the path (Little Berkhamsted footpath 8) leading into the cricket field and, keeping the hedge on your left, walk straight ahead back to Little Berkhamsted village and the option of refreshments at the Five Horseshoes or the village shop.